"Milkweed" redirects here. For other uses, see Milkweed (disambiguation). Asclepias is a genus of herbaceous, perennial, flowering plants known as milkweeds, named for their latex, a milky substance containing cardiac glycosides termed cardenolides, exuded where cells are damaged. Most species are toxic. The genus contains over 200 species distributed broadly across Africa, North America, and South America. It previously belonged to the family Asclepiadaceae, which is now classified as the subfamily Asclepiadoideae of the dogbane family Apocynaceae. The genus was formally described by Carl Linnaeus in 1753, who named it after Asclepius, the Greek god of healing. Members of the genus Asclepias produce some of the most complex flowers in the plant kingdom, comparable to orchids in complexity. Five petals reflex backwards revealing a gynostegium (fused stamen filamens and styles) surrounded by a five-membrane corona. The corona is composed of a five paired hood and horn structure with the hood acting as a sheath for the inner horn. Glands holding pollinia are found between the hoods. The size, shape and color of the horns and hoods are often important identifying characteristics for species in the genus Asclepias. Pollination in this genus is accomplished in an unusual manner. Pollen is grouped into complex structures called pollinia (or "pollen sacs"), rather than being individual grains or tetrads, as is typical for most plants. The feet or mouthparts of flower-visiting insects such as bees, wasps and butterflies, slip into one of the five slits in each flower formed by adjacent anthers. The bases of the pollinia then mechanically attach to the insect, so that a pair of pollen sacs can be pulled free when the pollinator flies off, assuming the insect is large enough to produce the necessary pulling force (if not, the insect may become trapped and die). Pollination is effected by the reverse procedure, in which one of the pollinia becomes trapped within the anther slit. Large-bodied hymenopterans are the most common and best pollinators, whereas monarch butterflies are not good pollinators of milkweed. Asclepias species produce their seeds in pods termed follicles. The seeds, which are arranged in overlapping rows, bear a cluster of white, silky, filament-like hairs known as the coma (often referred to by other names such as pappus, "floss", "plume", or "silk"). The follicles ripen and split open, and the seeds, each carried by its coma, are blown by the wind. Some, but not all, milkweeds also reproduced by clonal (or vegetative) reproduction. American milkweeds are an important nectar source for native bees, wasps, and other nectar-seeking insects, though non-native honey bees commonly get trapped in the stigmatic slits and die. Milkweeds are also the larval food source for monarch butterflies and their relatives, as well as a variety of other herbivorous insects (including numerous beetles, moths, and true bugs) specialized to feed on the plants despite their chemical defenses. Milkweeds use three primary defenses to limit damage caused by caterpillars: hairs on the leaves, cardenolide toxins, and latex fluids. Data from a DNA study indicate that more recently evolved milkweed species use these preventative strategies less but grow faster than older species, potentially regrowing faster than caterpillars can consume them. Milkweed is not grown commercially in large scale, but the plant has had many uses throughout human history. The milkweed filaments from the coma (the "floss") are hollow and coated with wax, and have good insulation qualities. 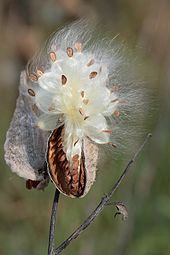 During World War II, more than 5,000 t (5,500 short tons) of milkweed floss was collected in the United States as a substitute for kapok. Milkweed is grown commercially as a hypoallergenic filling for pillows and as insulation for winter coats. A study of the insulative properties of various materials found that milkweed floss was outperformed by other materials in terms of insulation, loft, and lumpiness, but it scored well when mixed with down feathers. Milkweed fibers are also used to clean up oil spills. The bast fibers of some species can be used for rope. Milkweed latex contains about two percent latex and was attempted as a source of natural rubber by both Nazi Germany and the United States during World War II. No record has been found of large-scale success. Asclepias is also known as "Silk of America" which is a strand of common milkweed (Asclepias syriaca) gathered mainly in the valley of the Saint Lawrence River in Canada. The silk is used in thermal insulation, acoustic insulation, and oil absorbents. Milkweed also contains cardiac glycoside poisons that inhibit animal cells from maintaining a proper K+, Ca+ concentration gradient. As a result, many natives of South America and Africa used arrows poisoned with these glycosides to fight and hunt more effectively. Milkweed is toxic and may cause death when animals consume large quantities of the plant. Milkweed also causes mild dermatitis in some who come in contact with it. Nonetheless, it can be made edible if properly processed. The leaves of Asclepias species are a food source for monarch butterfly larvae and some other milkweed butterflies. These plants are often used in butterfly gardening. Asclepias cordifolia Heart-leaf milkweed, native to the Sierra Nevada and Cascade Range up to 2000 m.
Asclepias cryptoceras Pallid milkweed, native to the western United States. There are also 12 species of Asclepias in South America, among them: A. barjoniifolia, A. boliviensis, A. curassavica, A. mellodora, A. candida, A. flava, and A. pilgeriana. 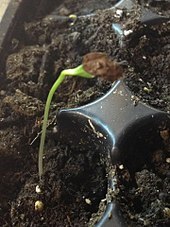 ^ a b "Taxon: Asclepias L." Germplasm Resources Information Network. United States Department of Agriculture. 2003-03-13. Retrieved 2013-02-05. ^ "Asclepias" (HTML). NCBI taxonomy. Bethesda, MD: National Center for Biotechnology Information. Retrieved 10 August 2018. ^ Singh, B.; Rastogi, R.P. (1970). "Cardenolides-glycosides and genins". Phytochemistry. 9 (2): 315–331. doi:10.1016/s0031-9422(00)85141-9. ^ a b c d e f Agrawal, Anurag (2017-03-07). Monarchs and Milkweed: A Migrating Butterfly, a Poisonous Plant, and Their Remarkable Story of Coevolution. Princeton University Press. ISBN 9781400884766. ^ a b Agrawal, Anurag A.; Petschenka, Georg; Bingham, Robin A.; Weber, Marjorie G.; Rasmann, Sergio (2012-04-01). "Toxic cardenolides: chemical ecology and coevolution of specialized plant–herbivore interactions". New Phytologist. 194 (1): 28–45. doi:10.1111/j.1469-8137.2011.04049.x. ISSN 1469-8137. PMID 22292897. ^ "Asclepias L." Plants of the World Online. Royal Botanical Gardens Kew. Retrieved 2018-11-23. ^ "Asclepias". ipni.org. International Plant Names Index. Retrieved 2018-11-23. ^ Quattrocchi, Umberto (29 November 1999). CRC World Dictionary of Plant Names: Common Names, Scientific Names, Eponyms, Synonyms, and Etymology. CRC Press. p. 211. ISBN 978-0-8493-2673-8. Latin asclepias and Greek asklepias for the common swallowwort; Asclepius, Greek god of medicine, the worship of Asclepius was centered in Epidaurus. See W.K.C. Guthrie, The Greeks and Their Gods, 1950; Carl Linnaeus, Species Plantarum. 214. 1753 and Genera Plantarum. Ed. 5. 102. 1754. ^ Frost, S.W. (1965). "Insects and pollinia". Ecology. 46 (4): 556–558. doi:10.2307/1934896. JSTOR 1934896. ^ Ramanujan, Krishna (Winter 2008). "Discoveries: Milkweed evolves to shrug off predation". Northern Woodlands. 15 (4): 56. ^ Agrawal, Anurag A.; Fishbein, Mark (2008-07-22). "Phylogenetic escalation and decline of plant defense strategies". Proceedings of the National Academy of Sciences. 105 (29): 10057–10060. doi:10.1073/pnas.0802368105. ISSN 0027-8424. PMC 2481309. PMID 18645183. ^ Hauswirth, Katherine (2008-10-26). "The Heroic Milkweed". The Christian Science Monitor. Retrieved 2014-02-14. ^ Wykes, Gerald (2014-02-04). "A Weed Goes to War, and Michigan Provides the Ammunition". MLive Media Group. Michigan History Magazine. Retrieved 2014-02-14. ^ Evangelista, R.L. (2007). "Milkweed seed wing removal to improve oil extraction". Industrial Crops and Products. 25 (2): 210–217. doi:10.1016/j.indcrop.2006.10.002. ^ Bernstein, Jaela (2016-10-13). "How a Quebec company used a weed to create a one-of-a-kind winter coat". CBC News. Retrieved 2018-01-05. ^ McCullough, Elizabeth A. (April 1991). "Evaluation of Milkweed Floss as an Insulative Fill Material". Textile Research Journal. 61 (4): 203–210. doi:10.1177/004051759106100403. ^ "Milkweed touted as oil-spill super-sucker — with butterfly benefits". cbc.ca. 2 December 2014. ^ Charles Sigisbert, Sonnini (1810). Traité de l'asclépiade. ^ Choi, Hyung Min; Cloud, Rinn M. (1992). "Natural sorbents in oil spill cleanup". Environmental Science & Technology. 26 (4): 772. doi:10.1021/es00028a016. ^ "La soie d'Amérique passe en production industrielle". Radio Canada. Retrieved 20 December 2015. ^ "GRIN Species Records of Asclepias". Germplasm Resources Information Network. United States Department of Agriculture. Retrieved 2011-02-22.